Breathable mesh back lining with nylon lined sleeves. Three large waterproof outer pockets. Additional waterproof zippered mesh pocket that can also be used as a vent. Full length adjustable zipped back ventilation system. Comfort stretch elasticized belt adjusters and adjustable cuff with Self-fastening tabs. Easily accessed waterproof thigh pocket. 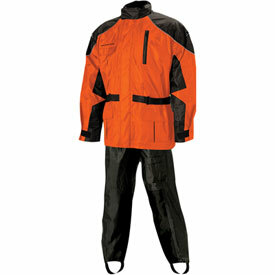 Reflective piping on both jacket and pants for night visibility. Pants boast oversized zipper gussets and elasticized ankle cuff and boot stirrups. Heat resistant material to protect legs from brief contact with hot parts. Integrated seat panel to minimize slipping and add strength. I'm looking for a rainsuit that will also break the wind, will this fit the bill? BEST ANSWER: I wish that I could tell you,but I never was able to get the rainsuit from Rocky Mountain ATV. If I wear a 52-54 chest size jacket, and want to wear this over, what size is recommended? BEST ANSWER: Looking at Nelson Rigg's sizing chart a 52-54" chest is a size Small. If you want to wear this over another jacket I'd suggest going up one size so a Medium. I will put the link to their sizing chart below.